Jacob H. Schnarrenberger of Springfield and Greenfield, Ohio, was a holder of quite a few (at least 7) US patents for calculating machines from 1888 until 1891 (most of patents are assigned to Thomas Reynolds of Springfield, one of the patents was granted to Jacob Schnarrenberger and his younger brother John Fred, one third assigned to Christian Funk): (US391430, US409710, US418930, US439431, US422040, US422545, and US465732). 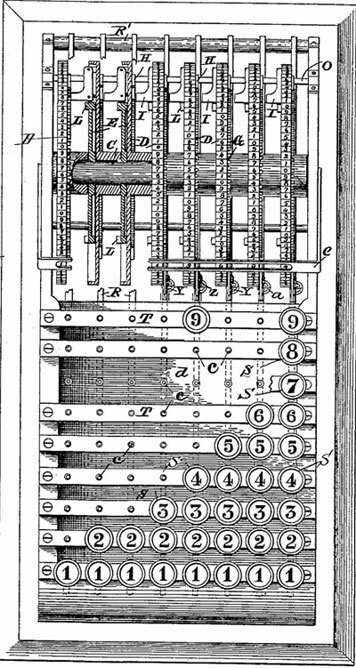 The first two patents of Jacob Schnarrenberger are for multi-column keyboard adding machines, as the second was an improvement upon the first (see the lower patent drawing from US391430), similar to the machine of William Burroughs. Let's give an example of the operation of the device, in which $101.04 are to be added to $95.00. The operator would strike key marked 4 at the extreme right hand, which would present 4 the slot of the sight plate by moving the disk from 0 through four of the teeth G. 0 being the next figure, and there being no key designated or marked 0, he would not disturb the second disk to the left. In the third or hundreds order he would strike key marked 1, which would move the disk one space and present 1 instead of 0 in the slot. The next figure being an 0, he would not disturb the fourth or thousands disk, for the above reason. The next figure being 1, he would strike key marked 1 in the fifth order and move that disk one space and present 1 in the slot. The figures would then read $101.01. Going on up the column in the example, he would observe 5. The operator would then depress key marked 5 in the third order, which would move the third disk five spaces, which, added to the one space already moved from 0, would present 6 in the slot. The next key to be depressed would be that marked 9 in the fourth order. This the operator would depress and move the fourth disk from 0 to 9. Thus $196.04, the sum of $101.04 and $95.00, is shown in the slot. 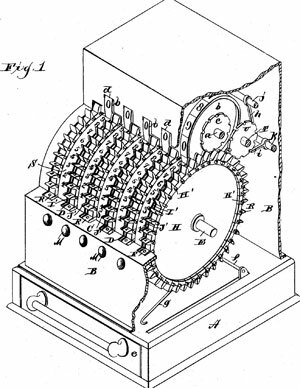 The next five patents of Schnarrenberger are for cash registers (although some of cash registers are specified as adding and subtracting machine), see the patent drawing from US422545 on the upper image. 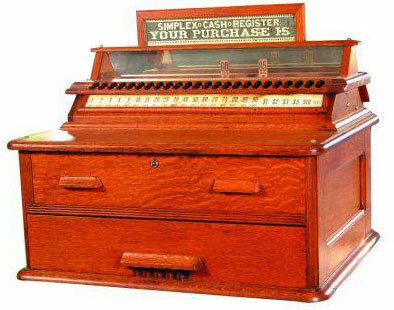 It seems Schnarrenberger's design for cash register and indicator from his last patent (US465732) had been used in the late 19th and early 20th centuries by firms associated with John Matthew Waddell from Greenfield, Ohio, whose primary business was in the building of display cases and other business furniture, but he produced cash registers also (see below the Simple Cash Register of Waddell). Very little is known about this obviously remarkable mechanic and inventor—Jacob H. Schnarrenberger. Jacob H. Schnarrenberger was born in 1859 in Ohio. He was the second child of Fredrick Schnarrenberger (1834-1891), a German emigrant, and Sarah Jane Schnarrenberger, nee Geller (1832-1895), from Ohio. Fredrick Schnarrenberger was a farmer from W端rttemberg, Germany, who left from Havre on the Ship Westmoreland and arrived in New York on 26 October 1854. In 1855 Fredrick Schnarrenberger established a farm in Madison Township, Highland County, Ohio, and in 1856 married to Sarah Jane Geller. In 1857 was born their first child—a girl, Mary (1857-1939), followed by 3 boys: Jacob (b. 1859), John Fred (b. 1865), and Frank (b. 1878). In 1880 US census records Jacob Schnarrenberger was specified as working in his father's farm. In Springfield City Directory of 1889 Jacob Schnarrenberger and his brother John Fred were specified as living at 77 E. Liberty str., Jacob working as a clerk at superintendent's office, while John was specified as a traveling agent. In the late 1880s Jacob Schnarrenberger was employed as a draftsman in Superintendent Thomas Reynolds' office of Sandusky and Cincinnati Railroad Co. in Springfield, that's why his patents of this time are assigned one half to Reynolds. By 1891 Jacob Schnarrenberger returned to Greenfield, Ohio, but nothing is known about him from that time on.